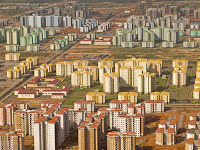 500,000 people in colorful modern apartment blocks, but nobody is moving in. Angolans simply cannot afford these $120,000-$200,000 apartments. The project was built by a Chinese state owned company and goes some way towards realizing the Angolan president’s promise of constructing one million homes in 4 years. The Chinese may have spent 3.5 bililion dollars on unsalable apartments, but the project helps them cement their relations with the Angolan government and their access to the country’s huge oil reserves. 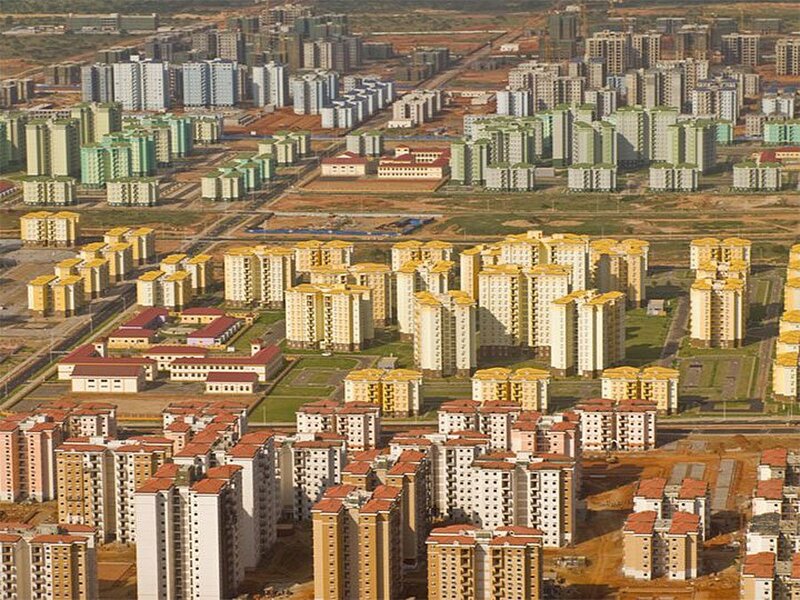 Furthermore- the apartments may end up getting filled, if banks and aid agencies step in with the mortgages to allow the tiny Angolan middle class access to this modern paradise at the price of a life time of debt. An American educated Palestinian anthropologist, Nakhleh was employed during these years in various capacities within the ‘aid’ structure, and provides a first-hand report of the economic processes that went alongside the Oslo political process. Instead of developing production and agriculture on the ground, money was poured into large import, export and tourism projects, all of which require close cooperation with the Israeli occupation (which controls the borders) to succeed and continue. Huge amounts of foreign capitalist and ‘aid’ investment were put into these projects. At the same time, what had formerly been grassroots social and political organizations were bought out with foreign ‘aid’ funding to become depoliticized NGOs working within the PA framework. International ‘micro-credit’ funding together with PA policy encouraged Palestinian households to borrow heavily, so that they are now deeply in debt. Through countless, meticulously researched examples, Nakhleh paints a picture of how the Palestinian Authority has become doubly dependent: once, like most ‘developing countries’ on foreign aid and loans, and again on the Israeli occupation, which arguably has gained more definitive control of Palestinians through these policies than it had through direct military government, and certainly in a more ‘cost effective’ way. Oslo, some have us have become fond of saying, is not a plan for independence but a sub-contracting of the occupation. Nakhleh now provides the sordid details of that contract, clause by clause. Here you can find out the who and the how: which Palestinian billionaires, PA officials, Israeli retired generals and international aid agencies are involved in exactly which money-squeezing dependency creating project. Quite a few people, when I told them what this book was about immediately asked: ‘and the man is still alive?’ certainly, this is a text to anger many. This is a book to fuel a revolution, but it is unlikely to be widely read. Instead of narrative, here are countless lists with clause and sub-clause, detailing the deals between PA, billionaires and NGOs. Abundant in economic and academic terms, the text is sometimes difficult to manage. Nakhleh’s own comments are filled with (well justified) anger and frustration, often erupting in the form of all too many exclamation marks. The book, in short, is well worth reading for those interested in its subject, but not an easy read. 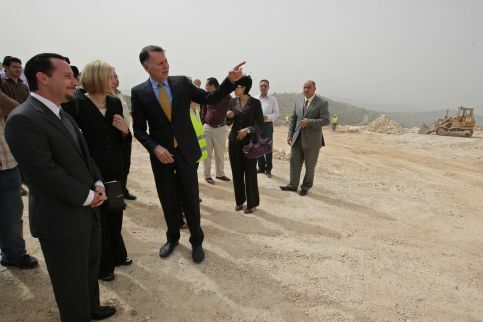 In order to convey something of its message in simplified form, let us examine what is perhaps the largest single investment project in the West Bank since Oslo, the planned city of Rawabi. 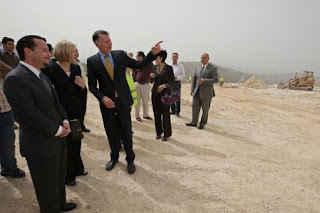 Rawabi is a half billion dollar housing project planned to be built in an area of currently barren hills North-West of Ramallah. It would provide housing for some 40,000 middle and upper-middle class Palestinians. The project was under taken by a public-private partnership of the PA with the Bayti Real Estate company (owned by Nablus born multi-millionaire Bashar Al-Masri with Qatari partners), with the assistance of the U.S Trade and Development Agency. It is considered the crowning achievement of the Fayyad government. 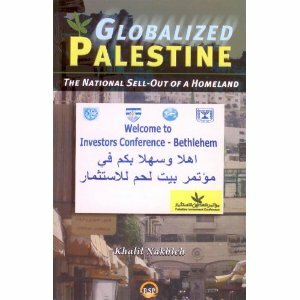 It first came about at a Bethlehem Investors conference in 2008, the poster for is also the cover of Nakhleh’s book. On the sign welcoming the international investors are the insignia of the Israeli police, the military government and the Israeli government and no mention of the PA. There is no place here to go into the sordid details of this project. Two main points should be conveyed: 1.the funding- the houses are intended mostly for PA employees, who would be taking huge mortgages from foreign banks and would depend on their (‘aid’ funded) PA salaries to pay them back over decades. 2. The access- the project depends entirely on Israeli approval for the building of the access road from Ramallah, which would go through area C and cross road 465, used exclusively by the settlers of nearby Ateret settlement. Imagine this: thousands of senior PA and NGO employees and contractors living in a luxurious suburb outside Ramallah, their physical access controlled by the Israeli army, their financial access guaranteed by loans and foreign funding. 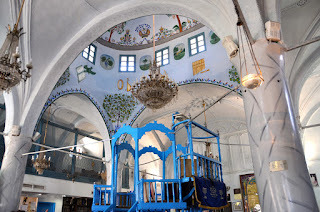 If the PA were to do anything to upset the occupation government or the foreign funders (such as offer real resistance to the status quo), Rawabi would end up much like Kilamba, a ghost city of pretty houses, cut off from the city, unaffordable, a monument to political corruption and clientalism, an apt symbol of the Oslo economy. ( http://electronicintifada.net/content/role-israeli-firms-raises-boycott-concerns-about-rawabi/9162 ). Al-Masri was heavily criticized for involving some Israeli Contracting companies in the project. This is a legitimate criticism, but like much “Palestinian-National” rhetoric, it focuses on the superficial and ignores the fundamental structure of dependency Nakhleh exposes so thoroughly. I love conspiracy theories, especially when they explain away Palestinian incompetence and corruption, and blame everything on the "occupation." I'll waste no time in reading it. 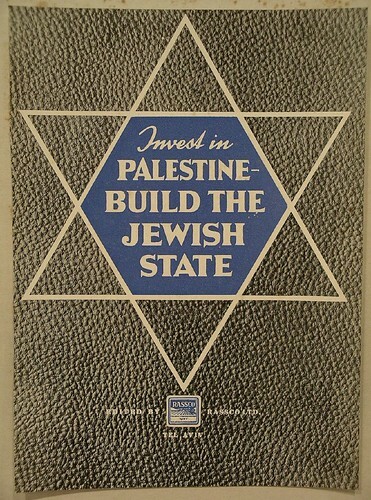 Far from explaining away Palestinian corruption, this book goes into it in more detail than anybody before. Nakhle holds responsible a coalition of "(1)Palestinian capitalists-political elite, (2)Palestinian ‘developmental' NGOs, and (3) transnational ‘aid’ agencies. The occupation is not in that conspiracy. However, it is no secret that all this is happening within a context wherein the Israeli military and government completely control the borders, air space, water resources and most of the land of the West Bank. Nakhle points out that the corrupt coalition of Palestinian politicians and businessmen with Palestinian NGOs and international aid agencies is blocking organized attempts to change this reality and is thus perpetuating the occupation.